The trek there is infamously problematic but only at certain times of the year due to adverse sailing or flying conditions. 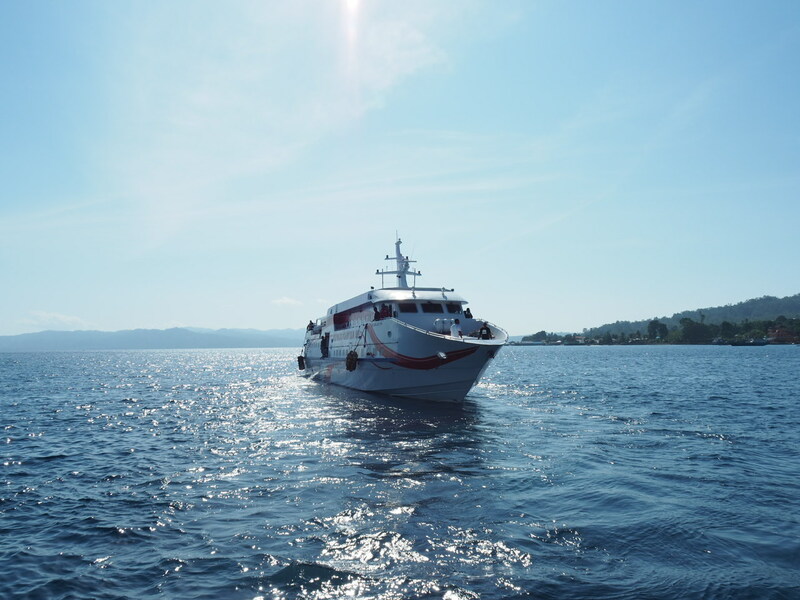 Ambon is the transport hub for this part of the Malukus and is easy to reach from the rest of Indonesia but it is worth factoring a generous amount of flexibility into your schedule as you are at the mercy of the frustrating transport timetables. All well and good if you have time to kill, but not really ideal if you are on a tight schedule. A little wiggle room is definitely recommended. 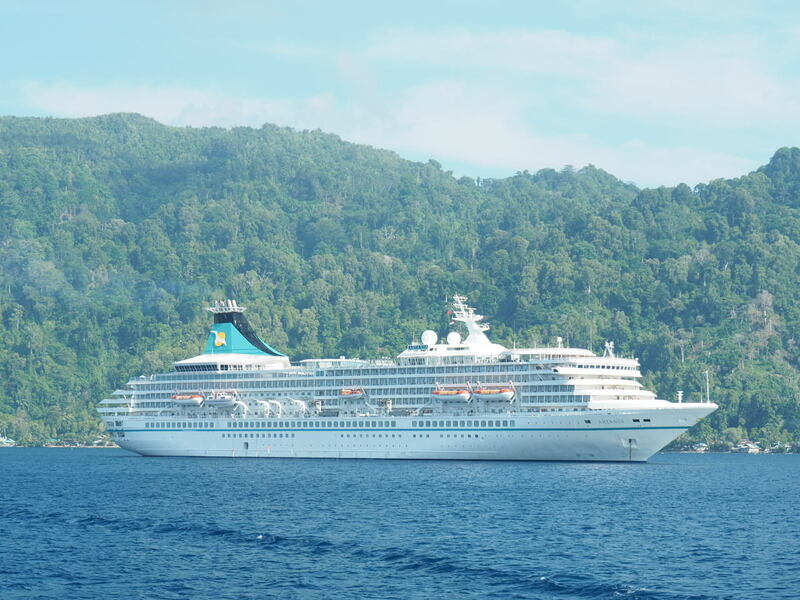 We read (and heard first hand) many tales of unsuccessful attempts to reach the Banda Islands but our journey went very smoothly and was stress free (relatively speaking). 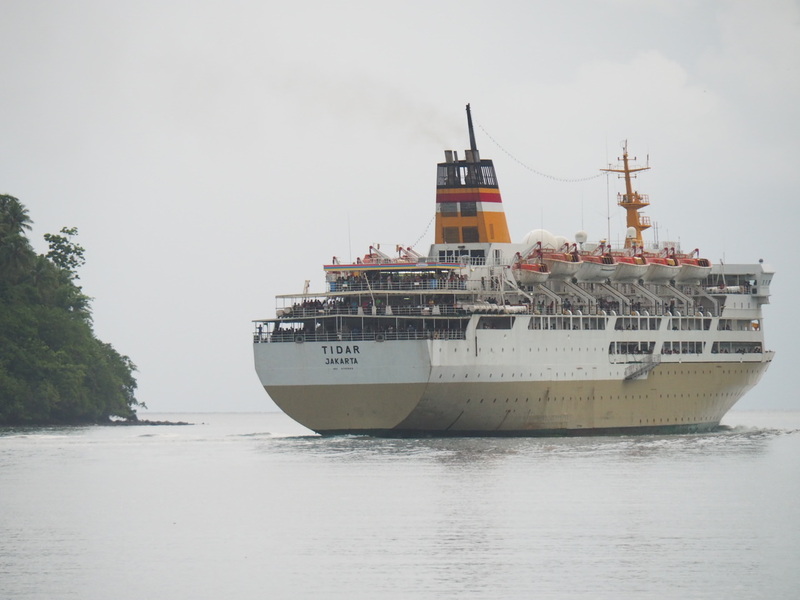 We opted for the fast ferry (5-6 hours) which sails from Ambon twice a week (Tuesday and Saturday) and does the return trip on Wednesdays and Sundays. Another option is the Pelni ferry which is pretty reliable (in that it usually turns up eventually). 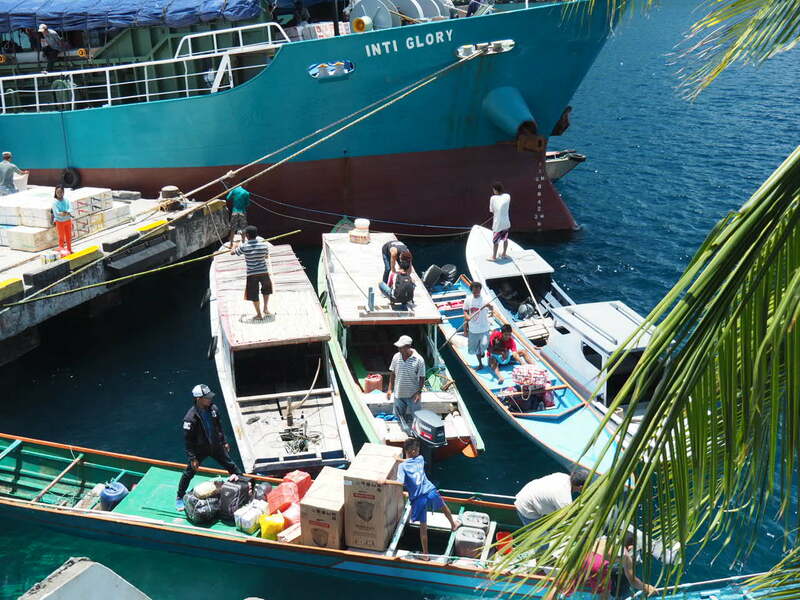 Pelni ferries are legendary in Indonesia but for all the wrong reasons. The Pelni takes about 8-10 hours but only sails once a week. There are other commercial ferry options but these are cheaper but less frequent, take much longer more circuitous routes and the crowded conditions apparently make the Pelni feel like a cruise liner (which takes some doing). 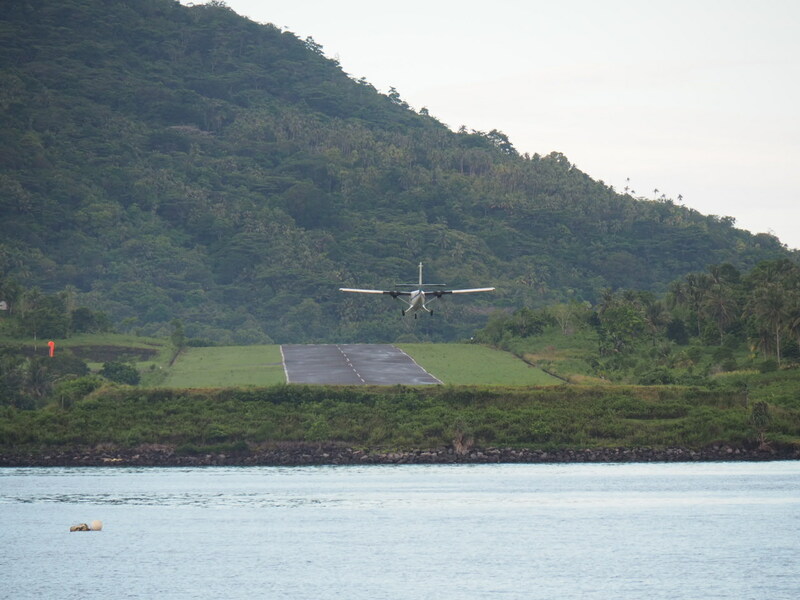 There are also Government sponsored flights between Ambon and Banda in 12 seater planes which run twice a week but are often delayed due to unsuitable flying conditions,. Online booking is not possible and you have to turn up at the airport office. Only 8 of the 12 seats are allocated to tourists so availability is hit and miss. Some people we spoke to were successful but others not so – it was very hit and miss. Flights usually stop running in December until mid January while the new contract is negotiated but otherwise run with fair regularity. However we recently heard that Aviastar (the current airline) stopped running flights in April 2016 due to technical problems and a shortage of planes. The bottom line is that if you’re on a tight schedule the fast ferry is probably the best option. 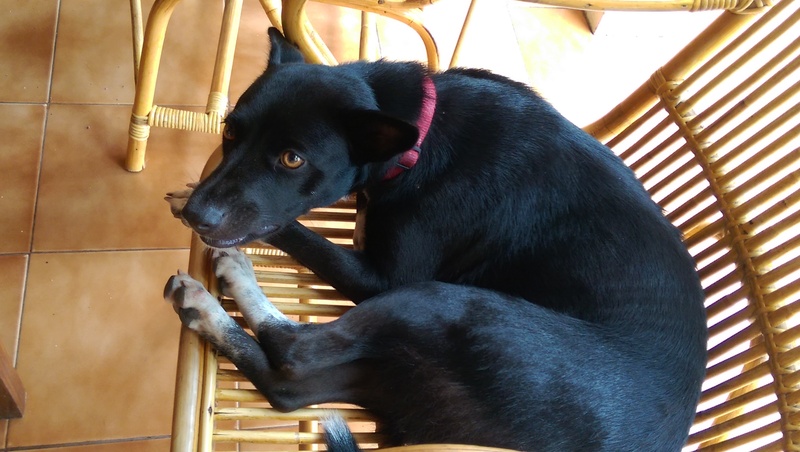 Avoid the monsoon months of late December and January, June and July as bad weather and particularly choppy sea conditions and high winds result in cancellations (apart from the Pelni which seems to sail in all weathers). The fast ferry didn’t sail at all last December due to rough seas (they are not built for those conditions) and there were no flights so many people had to abandon their plan to visit. 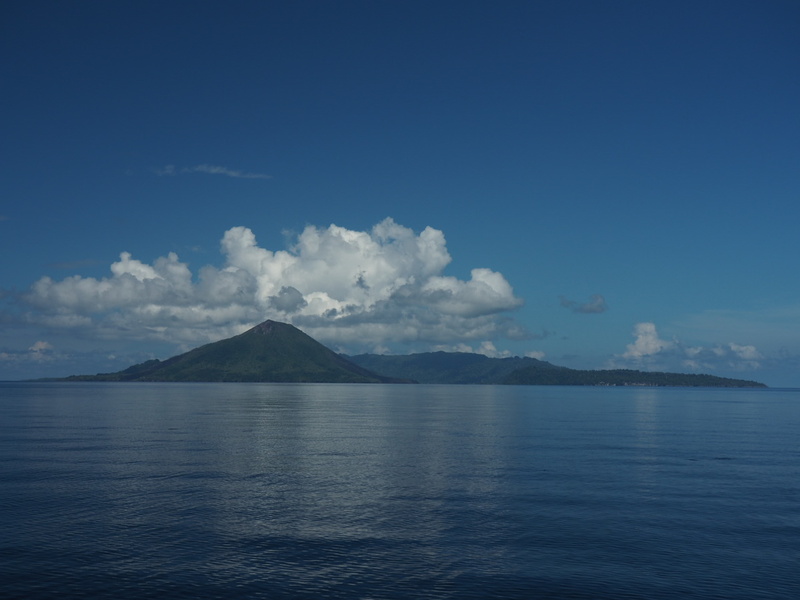 The Banda Islands are a group of 10 or so volcano islands located in the centre of the Maluku Islands. 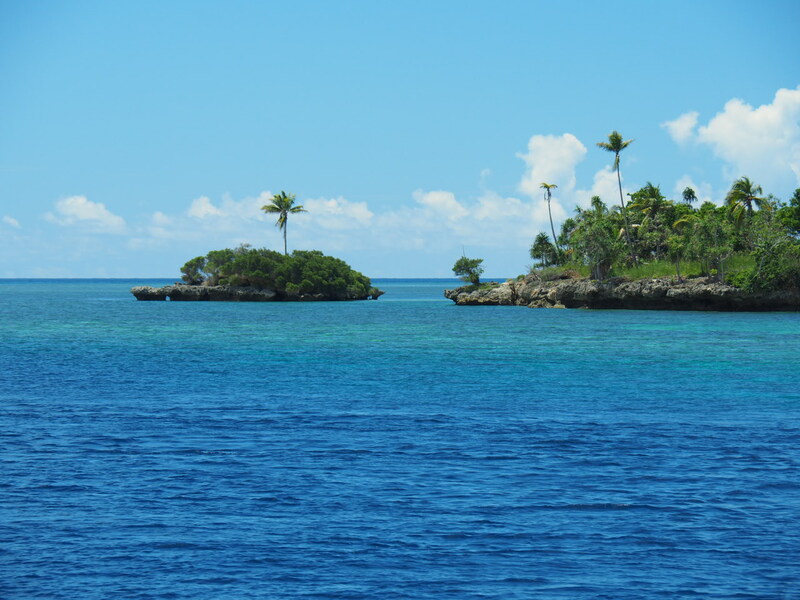 Bandaneira is not the largest island in the group but has the highest population. 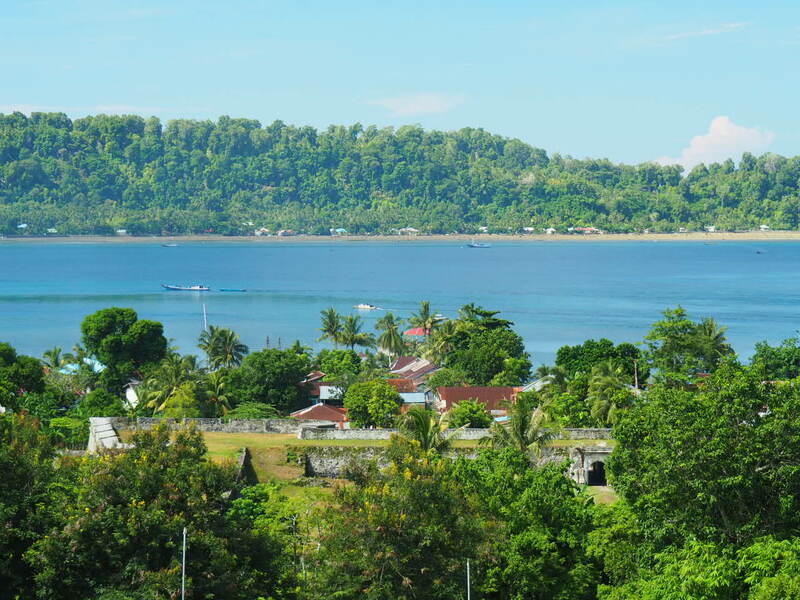 Bandaneira is also the name main town which looks across the bay to Gunung Api. 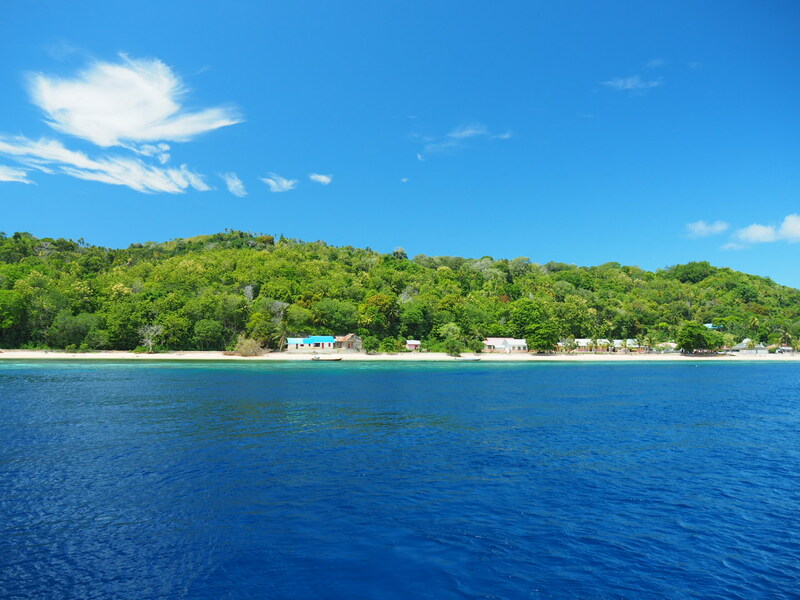 Nearby Banda Besar is biggest of all the islands but only has three settlements (it is very hilly and this terrain makes it difficult to build) and this was where most of the nutmeg was grown. 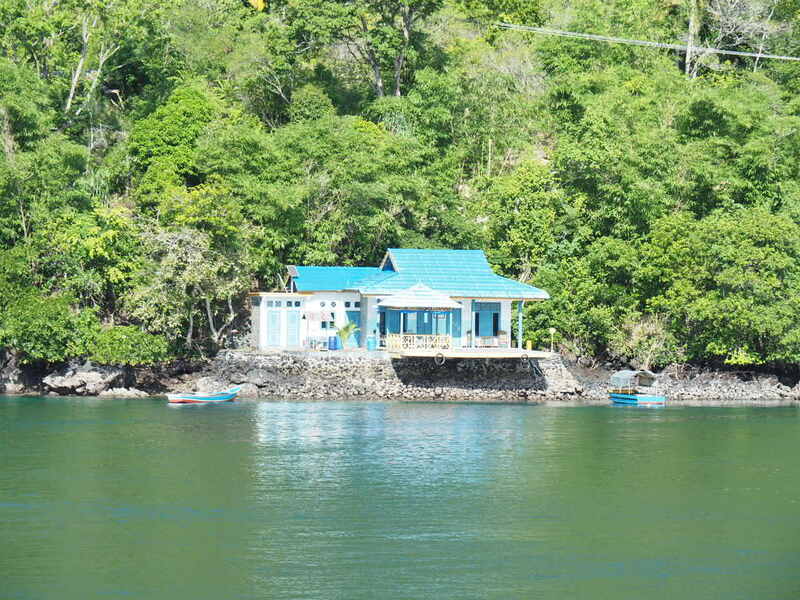 Gunung Api is the volcano island which dominates the group and has a few small villages (kampung) along the coast. We are told an early morning climb to the summit of the volcano to view the sunrise across Bandaneira and Banda Besar is worth the effort but obviously it was not something we considered attempting in the dark with our dodgy knees. The going is quite rough (particularly after rain) and although not a particularly long trek, you need to take considerable care on the uneven terrain, and it does take some time. Gunung Api is an active volcano and last erupted in 1989; word on the street is another one is due any day now. Pulau Hatta and Pulau Ai are popular destinations for short breaks from Bandaneira. 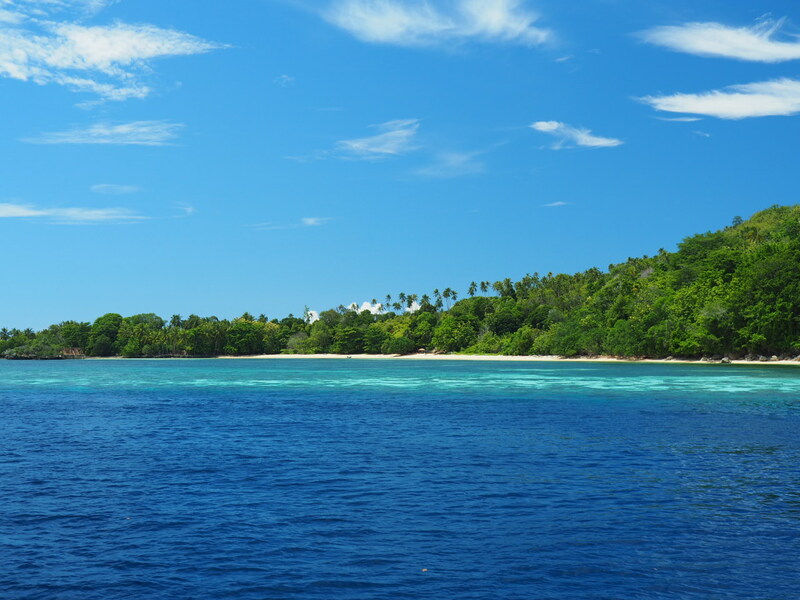 Both have lovely golden sandy beaches, spectacular snorkeling, and a number of basic but cheap homestays. Although Bandaneira can hardly be described as a bustling metropolis many people head over for a few days’ isolation and beach relaxation. We decided not to because we had spent quite a lot of time on beaches so far and it was nice to stay in a harbour town with a waterfront and lots of boats and ferries (and the odd cruise ship or private yacht) passing by. It had a bit of a different vibe (and we could always come back). In any event, the dive boat made several trips to Hatta and Ai and so we had a look at both islands and dived the reefs around their shores so although we didn’t actually set foot on them we got fairly close. We did not get to visit Pulau Run (the island occupied by the British in the Spice Wars and which they ultimately swapped for Manhattan) or the other tiny island controlled by the British, Pulau Nailaka. We have many reasons to return. This tiny place is a beautiful little gem, located all along the coast making the most of the harbour. You can easily walk from one end to the other within about 20 minutes and a proper exploration would probably take not much more than an hour if it wasn’t for the heat. 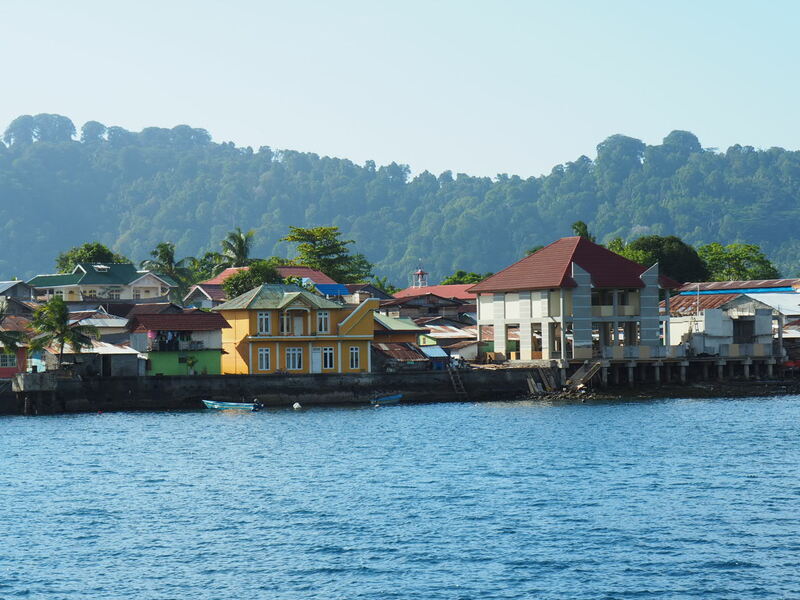 The town itself is a little ragged and ramshackle, but with a lot of character and history, friendly people, surrounded by amazing blue ocean and the breathtaking view across the bay dominated by the volcano . 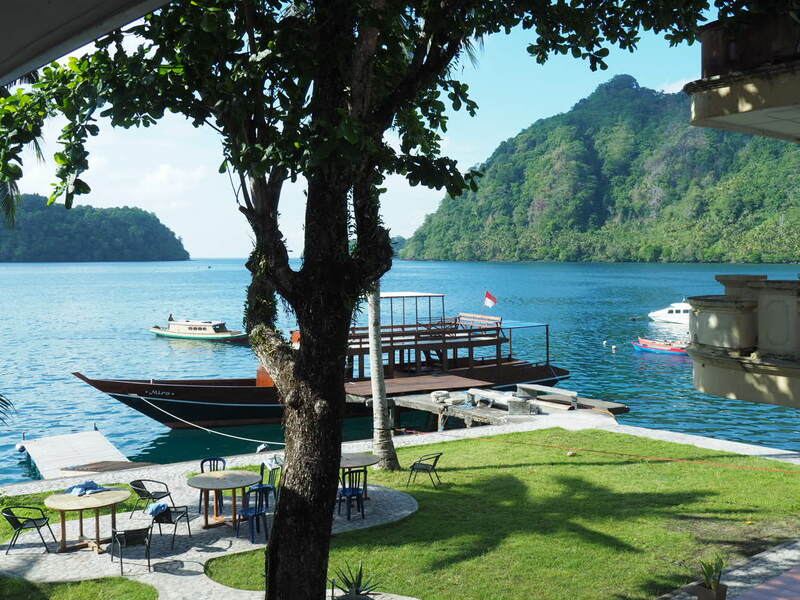 There are a few hotels and plenty of homestays all within easy reach of the harbour. 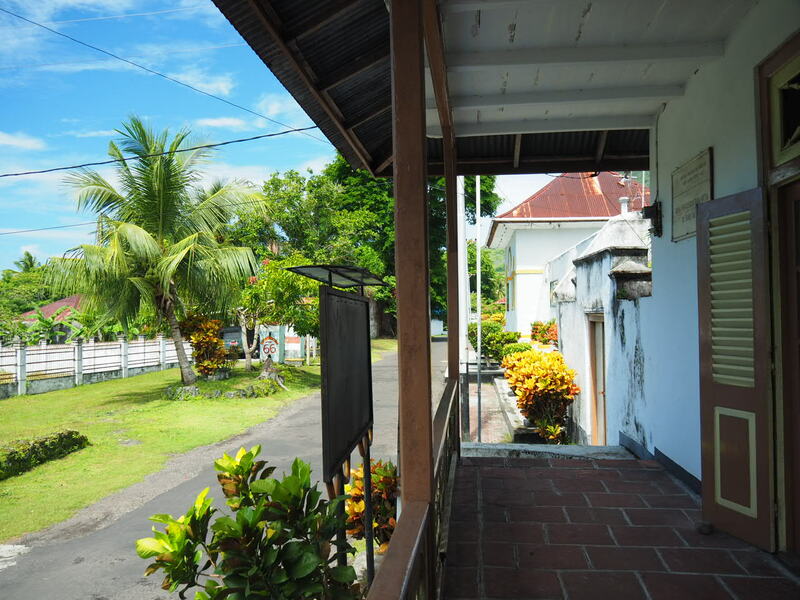 There are many warungs or rumah makans and cafés, and the main ones are were on the road leading south of the main mosque (which is opposite the harbour). There is a little local market further along that road, a hardware store and at the end of that road, turn right and you will find a bank complete with ATM. This was both a revelation and a relief because throughout Indonesia transactions are made almost exclusively in cash (including house and land purchases). We were always carrying a fair amount of cash, particularly if we were heading somewhere remote without access to an ATM. Late one afternoon the Wooky wandered down to stock up on cash which involves several transactions with the ATM machine because it only allows you to withdraw the equivalent of about £100 at a time. Once he had safely stashed the huge wad of cash (it always looks more than it actually is) he set off back to the hotel. A few minutes later he heard a scooter approached from behind, its rider calling out to him. When he turned around there was a local guy waving his card at him which he had left in the machine and forgotten about. That incident sort of sums up the Malukan people and the Indonesians generally. They are an honest and helpful bunch. We turned up at the Laguna straight off the boat and ended up staying for 3 weeks. It has since changed its name to Baba Lagoon and they were busy designing new logos while we were there. The hotel had undergone some refurbishment (with more planned for next year). 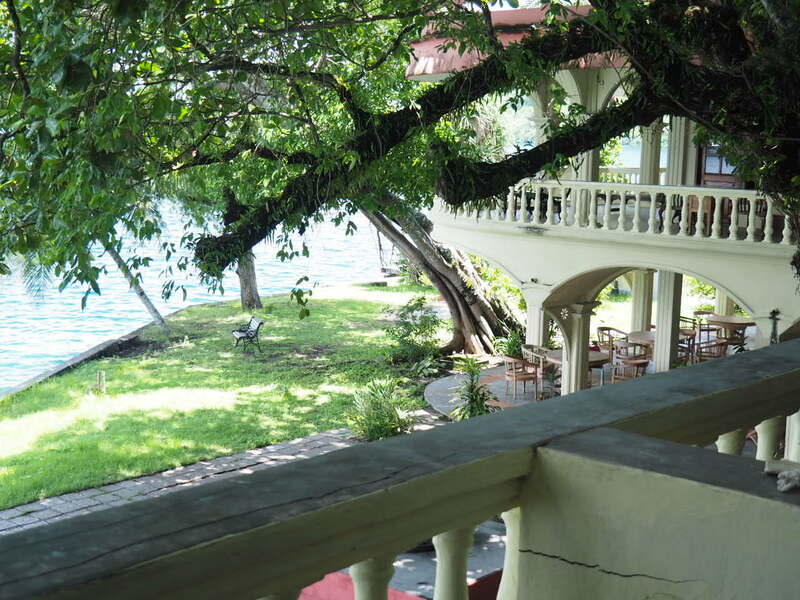 It was a colonial style building arranged around a courtyard facing onto the waterfront with an amazing view of the volcano. Rooms were simple and clean with air conditioning and it had really good WiFi which was a bit weird considering where we were. Breakfast was included in the room rate – eggs however you liked them and toast with, of course, the obligatory nutmeg jam which is delicious. The staff were friendly, if a little disorganized at times, but overall we really enjoyed our stay. 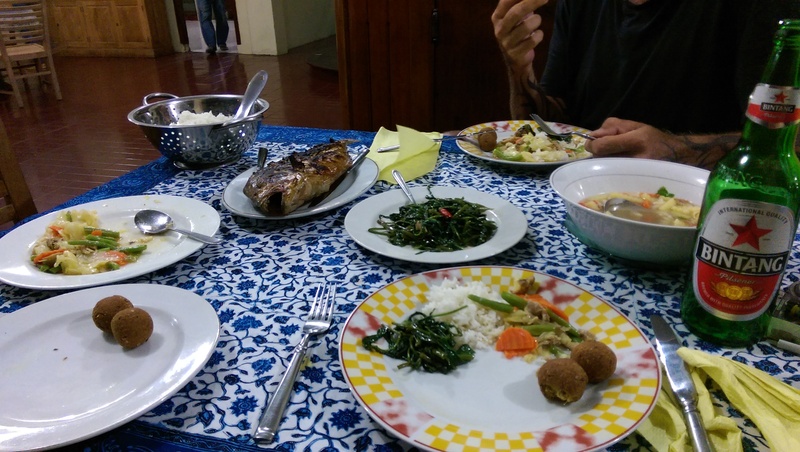 At the time we were there (February 2016) no other meals were provided (except lunch on the dive boat) but there were plans to offer a buffet style evening meal which many places in Indonesia provide. Beer and soft drinks were available. We generally went to the little local warungs or rumah makans just a short walk away near the mosque and harbour. At this point I was starting to tire of fish and rice and ordered chips where I could (yes I know I’m a heathen) and the chicken in the Nutmeg Café was absolutely delicious. Beer was available one or two of the warungs or rumah makans but not at some of the Muslim run places. We moved to the Maulana for our final week as the Laguna was fully booked and we decided a change would be nice. 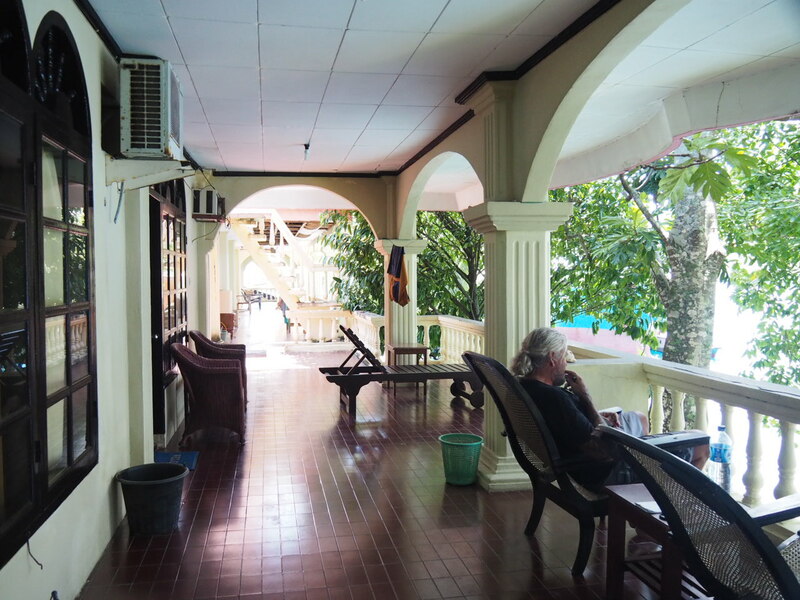 This hotel has seen better days and despite its colonial appearance it was only built in the 1980s by Des Alwi, one of General Hatta’s adopted sons (see below). In its heyday in the 1990s the Maulana hosted names like Princess Diana and the Rolling Stones. Des Alwi died in 2010 and, as happens throughout Indonesia, the his estate was divided between his children and grandchildren. Most of those beneficiaries still have an interest in the Maulana and they cannot agree to invest the money required to restore the hotel to its former glory. This once elegant hotel is now really quite dilapidated and could do with a bit of a makeover although it was getting a lick of paint at the time of our visit (due to the impending arrival of the vice president). The hotel was a bit shabby but it was clean has been well run by the manager and his assistant, and both go out of their way to help you. There were also a lot of cats, usually a sign that the owners are Muslim. I love them for that. On the plus side, if the Maulana was ever spruced up to anywhere near its former glory ruffians like us wouldn’t be able to afford to stay here (neither would the likes of us be welcome) so it was nice to stay in a place with a bit of recent local history and to try see beyond its crumbling facade to imagine what it would have been like to be a guest here in its heyday. No amount of decay and decline could take away from the waterfront view from the hotel grounds or from the terrace outside our room. There was an impressive view across the bay to the volcano and was the terrace was a lovely place to enjoy a beer, while the downstairs waterfront area was where we ate our meals. Breakfast was included (eggs, toast and nutmeg jam) and if you booked in advance they served a really good quality evening meal – way too much for two people but delicious, and always with a hint of nutmeg. 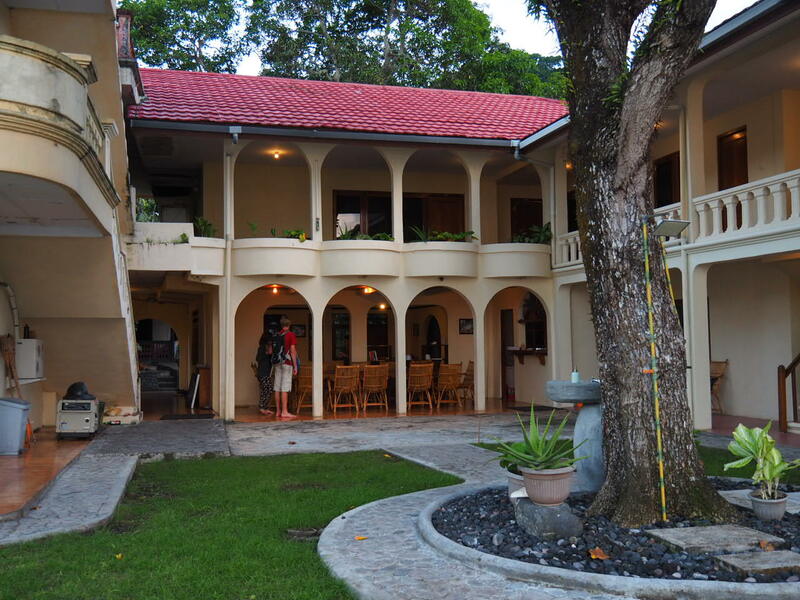 This new hotel located near the Fort Belgica and bordering the old Fort Nassau is rather grand with all mod cons although only a handful of rooms. It is run by Abba, a local with fingers in a few pies, who has recreated a building of ostentatious colonial luxury. 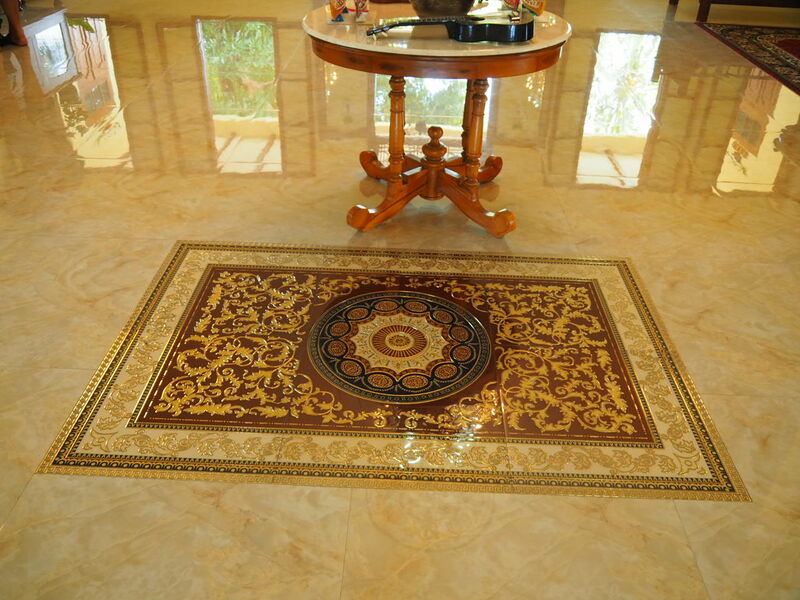 It is all marble, huge crystal chandeliers, with beautiful tiling and wonderfully carved wooden furniture. 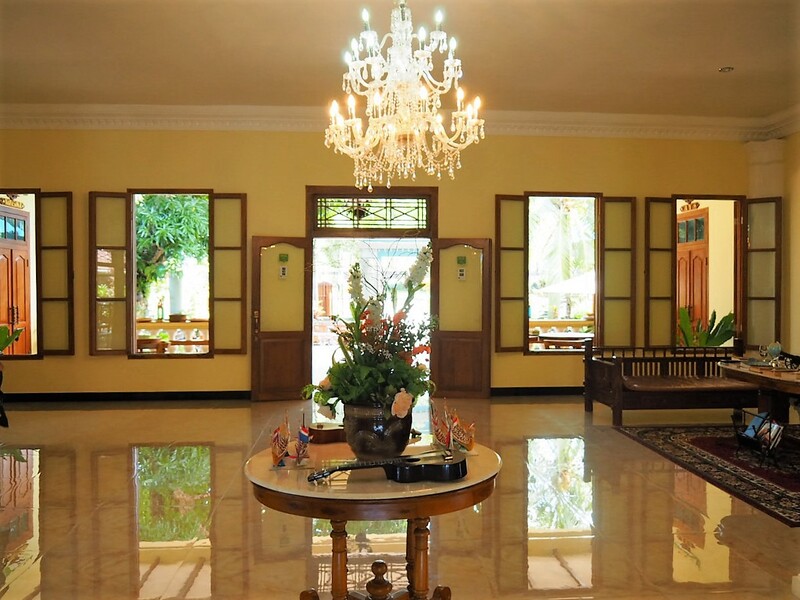 The lobby is spacious with high ceilings leading to large verandas and spacious terraces. While it was surprisingly reasonable to stay there, it was a bit too ostentatious for our liking and although we did go along for dinner one evening, and there is no denying the food was absolutely delicious, we didn’t feel very comfortable as the waiters were a bit too attentive, the other guests (mainly Russian but almost all European) enjoying a taste of colonial treatment at a fraction of the price you would pay in, say, Singapore. Bandaneira was preparing for a visit from the Indonesian vice president who was due to arrive a few days after we left. Village elders and religious leaders had commandeered local children to collect rubbish and the difference was extraordinary. Lots of frantic painting was also going on throughout Bandaneira and in particular outside the entrance to the little harbour which, if not being exactly transformed, was definitely benefitting from a fresh lick of paint. Even the Maulana Hotel was doing some last-minute minor renovations in certain areas (and a lot of painting) and there was a rumour that the vice president and his entourage was staying overnight in the “Prince Diana Suite”. 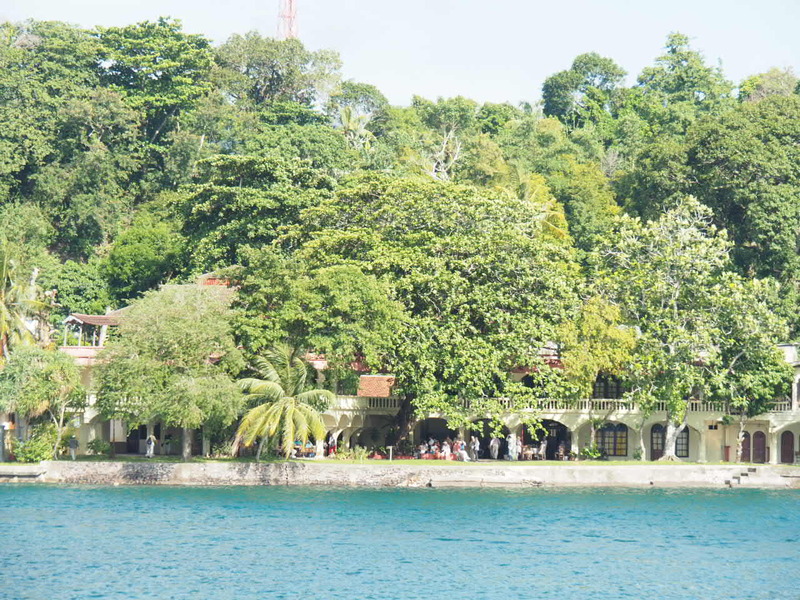 All this frenzied activity was having a positive effect on the overall appearance of Bandaneira which can look a bit shabby as a result of being neglected and largely forgotten since its glory days of being an important and valuable region during the Dutch colonial year. 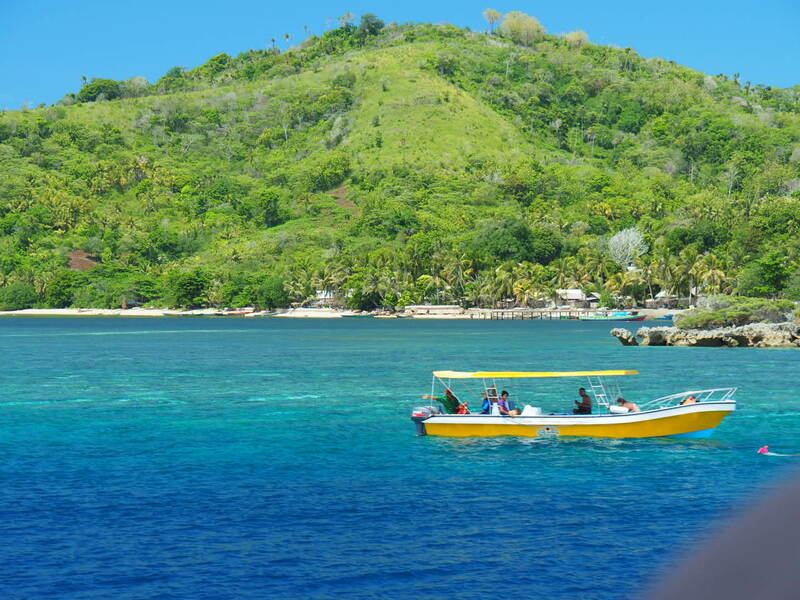 Pulau Hatta is named after General Mohammed Hatta, a prominent figure in Indonesia’s fight for independence and he was Indonesia’s first Vice President. 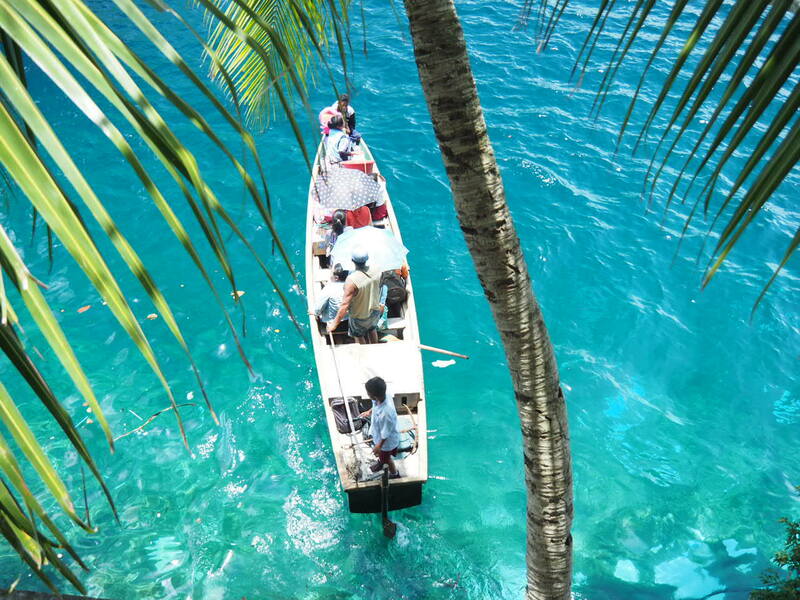 He spent time in the Banda Islands in exile from 1936 to 1942. During his time here he was something of a local philanthropist providing lessons to local children and teaching them about politics and history. General Hatta adopted a local boy Des Alwi, who himself went on to become a prominent historian and diplomat. Alwi spent much time elsewhere in Indonesia and abroad but returned to his beloved homeland to promote and personally invest in Bandaneira town. He built the Maulana Hotel which became a destination for the rich and famous. 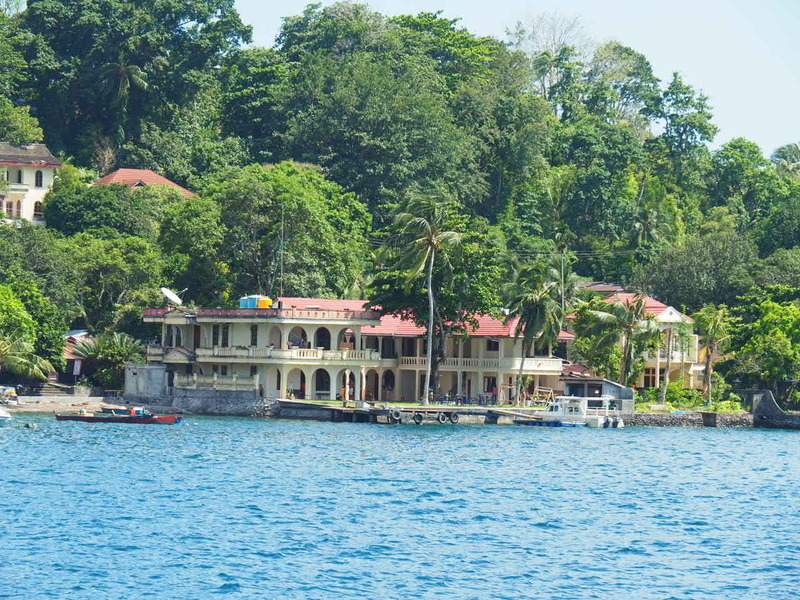 However, as one of the most wealthy and influential figures in the region, Des Alwi also had a bit of a monopoly on the diving in Banda for long time. Diving was difficult and expensive and therefore out of reach for most people. Since his death, opportunities have opened up for other operations and this little paradise is now more accessible. Growth in tourism hasn’t been huge and although many people make the journey, no large investors have shown a particular interest. For this reason the Bandas remains fairly low-key, authentic and you really feel like you stumbled across somewhere a little bit special.